My mom makes carrot kheer and i love it but never bothered to take the recipe from her. When i saw Anu's Carrot Kheer, i instantly started craving for it. To make it worse (or better, i should say! :)), it had almonds in it and i had to have it immediately. It was so easy too. Am glad i didn't wait to make it. It was super yummy! I pretty much stuck to the recipe except that i increased the quantity of almonds and reduced the milk to get thicker and creamier texture.I used blanched almonds. Soak almonds in milk (just enough to cover them) for about 15 minutes . Wash carrots, peel and pressure cook. Let it cool. 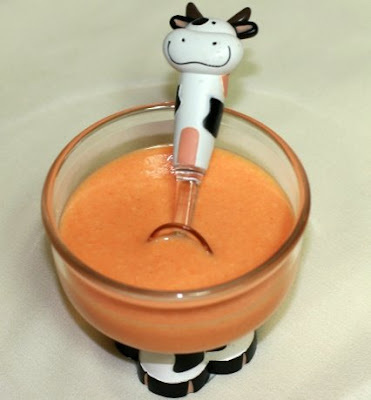 Add carrots, almonds, sugar, milk (I used boiled and chilled milk) in a blender and blend until smooth. Serve chilled. Cardamom is optional. My first son doesn't like cardamom, so i didn't add it. I liked the colour of this kheer so much, so didn't want to add any nuts or raisins to it either. I added only 2 spoons of sugar as both me and my husband don't like it, if it is too sweet. Pls. adjust the quantity of sugar as per your taste. looks super gorgeous n yumm Vibaas!!! lovely kheer vibaas...nice colour..Loved the bowl n spoon too..
Nice kheer.. looks yummy & nice colour.. Delicious kheer.The spoon and the bowl looks very pretty! ooks delicious..love the cute bowl..
Slurp! Love carrot kheer (me too)! I'm craving for it too! Looks colorful! That bowl and spoon looks cute! mmhh yum ya yum yum yum Vibaas...pass me over that cup :). Looks so delicious. I bet kids will eanjoy it so much. Its very healthy too. Good one will try sometime. And, u look beautiful in the new snap Vibaas :). Yummy, carrot kheer..i love the glass and the spoon..so cute! Hi Vibaas, you have a wonderful blog here...The carrot kheer is lovely and looks very nutritious...I loved the bowl and the sssssssssspppooon rockss! this is what i planned to make tom for dessert.healthy for kids also. love the spoon and bowl.nice presentation. lovely bowl n soup...looks yummy!! 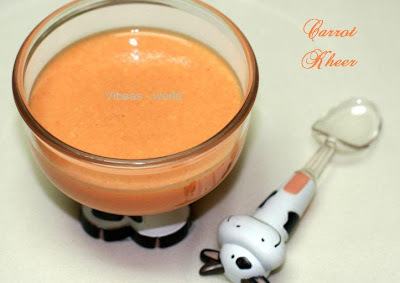 Carrot kheer another great way to eat carrot! very yummy - love the bowl and spoon! looks sooo good! Delicious and nutritious! Cute spoon and great clicks! Hoo..Kheer looks so coloful and tempting..what a choice !! wow thats a great inviting kheer vidhya..
Kheer looks delicious Vidya...Beautiful color...love the combo of carrots and almond...bowl and spoon looks cute. Cute presentation! And looks yummy! Carrot with almond kheer looks simply delicious. Good color too. Thats indeed rich and creamy! Hmmmm.. yummmm! Good to hear u all loved this recipe..
ohhhhh wow .lovely kheer and click. love the colour! and the combo with almonds is so healthy for kids..have to try this for my daughter..
Nice click. Kheer looks colorful and delicious. This is yummy yummy dear,..! Love the entry a lot..! Delicious and healthy recipe.Thanks for dropping by my blog. First time here.Had to stop after a peek at the carrot kheer.The colour is so soothing and I know it tastes dam gud cos my amma makes this. looks awesome.../fst time here...your blog background color is similar to mine..
Kheer looks so d'lish and mouth watering. Wow lovely kheer. First time to your blog. Do visit my blog when you get time. Good one, simple to make yet nutritious.